3-tier adjustable rack to air or dry laundry. Convenient, foldable and with 3 rubber feet for grip. Detachable first tier has 4 clip arms with 6 clips per arm for drying hand towels or socks. 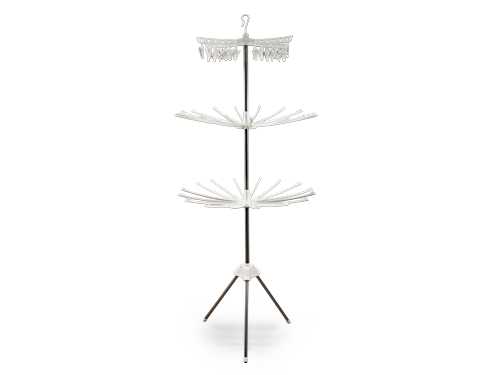 Foldable second and third tier has 16 hanger arms each for drying bath towels and other clothing. Material: 430 stainless steel and PP. Size of arms 35(L) cm with adjustable 40(H) cm between tiers. Size open: 75.5(L) x 75.5(W) x 179(H) cm.